By executing this program, which is in public domain, a G-code file is generated. 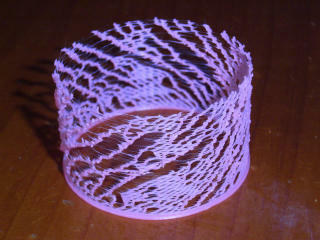 By sending it to a 3D printer, fluctuated 3D print patterns (or natural-design patterns) can be generated. Every time the printer prints a different pattern. This program is for Rostock MAX, so the program may have to be slightly updated for other 3D printers. For the above command, a PLA filament is to be used and the print pitch (layer pitch), 0.5 mm, and the average cross section of the filament, 0.05 mm2, are specified in the program. ABS can be used instead of PLA. More detailed parameters can be specified as follows. Note that I have not written any patents or similar intellectual properties on this issue because fluctuated 3D printing is caused by nature. This page contains a single entry from the blog posted on April 19, 2015 2:49 PM.